A perfectly lovely vegetarian dish. You can make your own gluten free pastry or else buy the round, ready rolled Pasta Brise. This free form pie or Galette as it is also known, is quick and simple to make as you do not have to line any pie dishes with pastry, just fold up the pastry edges with your hands to contain the filling! Place all the chopped veggies into a large freezer bag. In a small bowl, combine the olive oil, balsamic vinegar, dried herbs and seasonings. Pour this in the freezer bag and shake to cover the veggies with the oil mix. Place the veggies on lined baking trays and roast them in a preheated oven 220C for approximately 30 to 40 minutes, turning them half way through cooking. When ready take out and leave to cool. Put into a large bowl. Squeeze the garlic out of its skin and add to the veggies. Add the black olives and the freshly chopped basil. Combine everything well. Lower the oven temperature to 185C. Roll out the pastry in a circle between two sheets of baking paper. Gently lift the pastry together with the paper and place on a baking sheet. Sprinkle the crumbled feta and grated Parmesan in a circle on the bottom, leaving a border all around. Top this with the ratatouille. 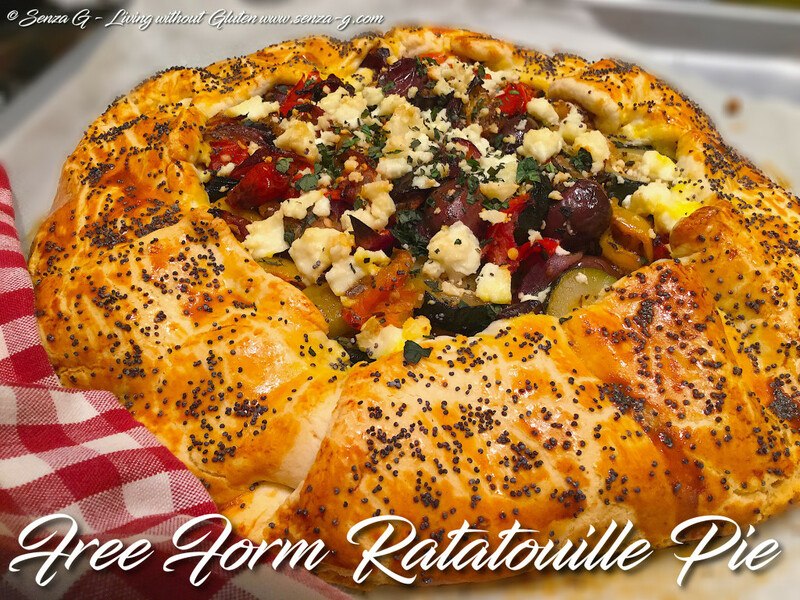 Lift the pastry edges and fold over the ratatouille. See photo. Sprinkle the top with more crumbled feta cheese. Brush the pastry with combine egg yolk and water and sprinkle with poppy seeds. Place in the oven and bake till golden. If it browns too quickly cover it with foil.